Welcome to another instalment of Once Were Hitmakers. 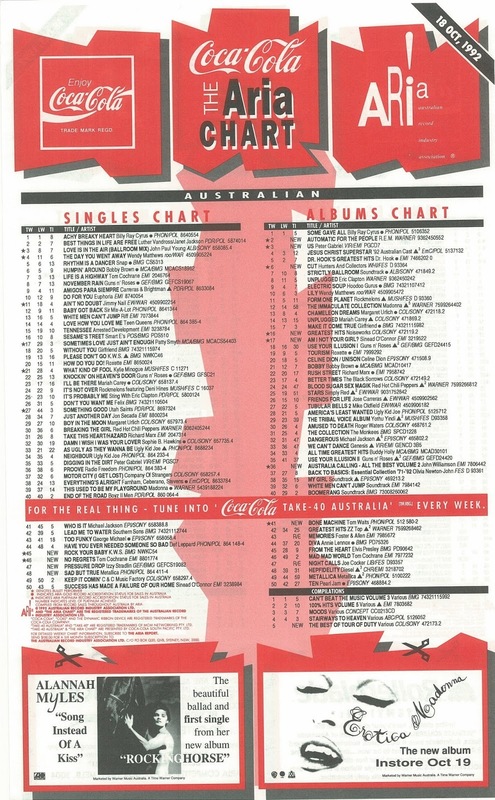 That's right, our flashback to the ARIA chart from this week in 1992 features a bunch of artists who'd all previously reached the top 10 but stumbled with their latest singles. From two female performers who were massive in 1990 to two acts that had much more recently almost topped the chart to two local male singers whose top 10 days were behind them, it's a cavalcade of under-performers. An artists who would soon - but not soon enough - be joining the ranks of former hitmakers was at number 1 this week in 1992. "Achy Breaky Heart" by Billy Ray Cyrus stayed on top for a third week. Two years after he was last seen in the top 40 and three-and-a-half after number 3 hit "Stuck On You", Paul Norton returned with this taste of second album Let It Fly. Landing pretty much where she last peaked in mid-1991, Betty Boo didn't find the Australian public any more receptive to this dreamy cut from second album GRRR! It's Betty Boo. Like Paul Norton, Mark Williams had last featured in the top 40 in 1990, but this lead single from the Mind Over Matter album didn't send him back to the heights "Show No Mercy" had scaled. Both the late singer and this song - a number 1 for him in 1961 - had done better on the Australian chart before. But at least this duet remake, which had originally been released in 1987 and was reissued to promote King Of Hearts, achieved more than the album's first single, Roy's cover of "I Drove All Night", which missed the top 100. The only act who hadn't previously scored on the ARIA chart was American singer/songwriter Jude Cole. This title track from his third album was his only top 100 appearance. The biggest fall from grace this week belongs to Canadian singer Alannah Myles, who, like Betty Boo, had shot to success locally in 1990, albeit with a very different style of music. 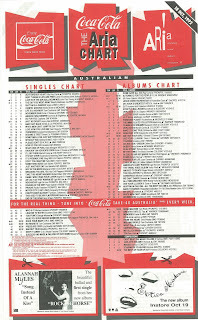 The first single from second album Rockinghorse, understated ballad "Song Instead Of A Kiss", was also pretty different from the two hits Alannah had enjoyed simultaneously in Australia, "Love Is" and "Black Velvet". Apparently, Alannah had been in favour of releasing "Our World, Our Times" (which ended up as the third single) instead, since it was more in line with what people would expect from her, but her label insisted on going with "Song Instead...". While their choice did well in Canada, it came nowhere near the ARIA top 100. It was fair enough that this latest Metallica track didn't progress any further than this entry position - it was, after all, the fourth release from Metallica in Australia and the previous three singles had all peaked inside the top 10. Written about the hold religion has on some people, "Sad But True" crept into the top 50 to become the least successful single from the album locally, including a fifth single that was still to come. He'd been responsible for co-writing some of Guns n' Roses biggest hits, like "Sweet Child O' Mine", "Patience", "You Could Be Mine" and "Don't Cry", but as his former band continued to lift singles from their Use Your Illusion albums, guitarist Izzy Stradlin embarked on a new musical journey. With his new band, The Ju Ju Hounds, he released an eponymous album, which contained this blistering remake of a song originally recorded by reggae band The Maytals in 1970. It would end up as Izzy's only solo top 50 appearance. "Life Is A Highway" was still inside the top 10 and it was joined on the top 50 by this far less memorable follow-up. In fact, not only could I not remember this at all from 1992, but I've just listened to it now and I still couldn't sing it for you. A much more modest hit, "No Regrets" would be the last time we'd see the Canadian singer on the chart. British dance trio KWS had reached number 2 with their cover of KC & The Sunshine Band's "Please Don't Go", which spent its final week inside the top 20 this week, and they didn't venture too far with their follow-up. Another remake of a disco classic, "Rock Your Baby" was originally recorded by George McCrae (and taken to number 2 in Australia in 1974), and was written and produced by Harry Wayne Casey and Richard Finch of... KC & The Sunshine Band. Lightning didn't strike twice for KWS, however, with their take on the tune barely making the top 40, probably because it was nowhere near as good as "Please Don't Go". The group would make one final visit to the top 40 with another cover in two years' time. Next week: a completely different kind of chart week, with three new hits from some of the world's biggest names that all burst straight into the top 20. Meh! Pretty forgettable bunch of debuts here. What's more annoying is that neither REM or Peter Gabriel could boot that cretin Billy Ray Cyris off the albums chart no.1. If I remember correctly, 'When We Were Young' was given a few airings on the Summer Bay Diner jukebox, such was the knack of the show's musical producer selecting flops. I don't have it, but there was a video, which I think was shot in black and white. Don't think I've heard the Mark Williams track since '92. Nice to see someone has uploaded the video. Things like the Jude Cole and Tom Cochrane tracks sound like they belong more in the late 80s than the early 90s. I love 'Song Instead of a Kiss', but other than this single of the week mention and catching the second half of it once by chance by flicking the dial onto AM, I never head it at at the time... so its low peak is not that surprising. Alannah reminds me of 'That Don't Impress Me Much'-era Shania in some of those outfits in the video. Few can do the 'rock ballad' genre better than the Canadians from this era, for some reason. Don't think I heard the Izzy Stradlin song at the time. I expected it to be more like GnR. 'No Regrets' would never have charted if not for 'Life Is a Highway'. There's a naughty 4 letter word beginning with S in the verse before the final chorus, which I had forgotten about until listening to it again now. I actually much prefer 'Rock Your Baby' to 'Please Don't Go'.